Refreshing drinks for hot summer days that are non-alcoholic. (Be careful of alcoholic drinks when it’s hot.) These drinks are cool, refreshing, and are sure to please the toddlers to grandparents. This Citrus tea recipe is diabetic friendly but can be made with sugar instead of Splenda and regular lemon-lime soda instead of diet for those who enjoy sugary drinks. The Sugar-Free Russian Tea is also for diabetics but can easily be changed to regular by using sugar mixes instead of sugar-free and sugar instead of Splenda. The Raspberry Lemon-Limeade is a special fruity treat that can be made diabetic friendly by substituting Splenda for the sugar. Pour boiling water over tea bags. Cover and let stand 5 minutes to steep. Remove bags and discard. Transfer tea to a medium-size pitcher. Add Splenda and still until dissolved. Add cold water and juices. Cover and refrigerate at least 1 hour. 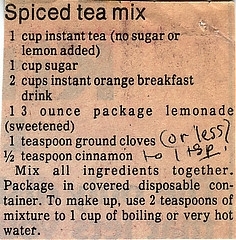 To serve, add the lemon-lime beverage to the tea and stir to mix well. Serve over ice in individual glasses. Combine all ingredients and mix well. Store in an air-tight container. To make 1 serving, add 1/4 tsp of mixture to 3/4 cup hot water. Stir well and enjoy. In a 2-quart pitcher, combine the lemon juice, lime juice, sugar, and water. Stir until sugar is totally dissolved. Add the raspberries. Cover the pitcher and chill overnight or for a few hours. Serve over ice with lemon and lime slices for garnish, if desired. HERBALIFE Beverage Best Mix With Tea & Herbal Aloe Free& Fast Shipping. HERBALIFE Beverage Mix + Tea + Aloe Fast Shipping From US.